Irish cross-country skier Thomas Maloney Westgaard finished 47th in today’s classic 30km race at the World Nordic Skiing Championships in Lahti, Finland. Westgaaard clocked a time of 41 mins 03.2 secs, putting him 4 minutes 19 secs behind the winner Livo Niskanen of Finland. He was moved up two places when two competitors were disqualified for “skating”. It was a best ever result for an Irish skier at the World Championships. Westgaard, who is 21, and has a Dublin-born mother, has competed at World Cup events in Norway, Sweden and Estonia this winter and is Ireland’s only A ranked athlete. He switched nationality from Norway, where he lives, to Ireland last summer with the World Championships his goal. He has already qualified for next year’s Winter Olympics. He will end his season at next weekend’s World Cup in Oslo, Norway. Also competing in Lahti is Olympian Jan Rossiter, along with Stephen O’Mara, Brian Kennedy and Dominic McAleenan who is the team captain. As B ranked athletes, they can compete in a single race at the championships. Irish teams have competed at the World Championships since 2003. 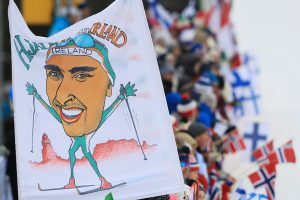 In 2002, Rory Morrish from Cork, who came from an orienteering background, was the first Irish cross-country skier to qualify for an Olympics. Morrish competed in his sixth World Championships two years ago. Thomas Maloney Westgård (21): Born and lives in Norway; mother from Co Galway. A first year senior skier and already qualified for the Olympics next year; as an A athlete, can compete over any distance he chooses at World Cup and World Championships level. Jan Rossiter (29): Lives in Canada; parents are Irish and Czech. Competed for Ireland at 2014 Sochi Olympics and at two world championships. If he can qualify for the 2018 Olympics in Korea, Ireland could enter the team sprint. Steve O’Mara (35): Lives California, USA. Father from Dublin. Skiing for two years. His first world championships. Brian Kennedy (25): Lives Soldier Hollow, Utah, USA. Father from Roscommon. Sking for two years. His first world championships. Cathal Nolan (25): Planning to relocate to Austria; focusing on the next World Championships in 2019. Dominic McAleenan (47): From Banbridge Co Down. Lives in Sweden and this is his second world championships; he was the oldest competitor both times.